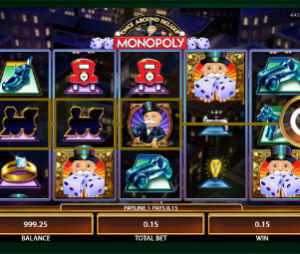 Irish Eyes is a five-reel slot developed by Microgaming in 2010. Inspired by Irish folklore, it takes you down a road paved by golden coins winding through a magical meadow under a rainbow where you will meet one of the most popular Irish fairies, a leprechaun. As leprechauns can grant you three wishes, make sure that one of them is to get as many of them on reels as you can along with red haired lady with enchanting emerald eyes, as they award outstanding prizes. Despite, or should we say thanks to its relative simplicity, Irish Eyes slot became many players favorite, which made Microgaming to release a sequel, Irish Eyes 2. You can play this game for free here on our site, or for real money at one of the recommended Microgaming casinos. Once you find yourself on a beautiful meadow, you will be delighted by a landscape. If you are superstitious you will love to see a little creature in green and a four-leaf clover. Along with a symbol depicted as a landscape in the backdrop and a pot of gold, they stand for high paying symbols, while low paying symbols are represented by playing card symbols from nines through aces. The graphics of Irish Eyes slot may appear a bit outdated, for sure compared to some of the new online slots. It actually more reminds some of RealTime Gaming slots, rather than Microgaming. The game is played at 25 adjustable paylines with a coin value from $0.01 up to $2 per line, meaning that you can wager from $0.25 up to $50 per spin which may please all kind kinds of players. You need to align three or more symbols consecutively on an active payline in order to get a prize. The expected lifetime return is 95.04%, which is below the average. For more rewarding games you can check our Top Microgaming slots rating. The most lucrative symbol is Wild represented by the leprechaun acting as joker, the bonus symbols and delivering the 10,000 coin jackpot for landing five of a kind. When you land it simultaneously on the reels 1 and 5, you can play Pick Me Bonus game and win up to 100x total bet. Landing three or more Scatter Ladies left to right triggers 12 free spins during which all your winning will be tripled. Free spins can be retriggered. Irish Eyes slot offers many winning chances. Although its graphics may seem a bit old-fashioned, the payouts are great as well as its rewarding features. The gamble feature is incorporated in the game letting you double or lose each payout you get via the standard means.